"The sangha are the unsurpassed merit for all the world. and worthy of being addressed with joined palms." Daily in the monasteries, the routine of study, prayers, and dedications aimed at temporal benefit of beings and ultimate realisation of supreme liberation goes on. The way of life upholds and preserves the vast and profound body of teachings, rites, rituals, and practices of the Buddhadharma, especially of the Karma Kagyu lineage of Vajrayana Buddhism. Discipline underlies all the various trainings of a monk and is the essential foundation for proper conduct and all spiritual attainments. Jamgon Kongtrul Labrang is committed to the welfare, training and education of the sangha. 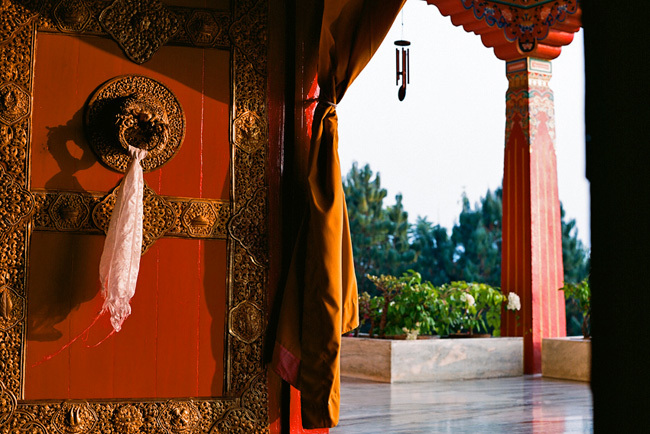 Monks who have successfully completed the 8-year basic curriculum of general Buddhist studies have the option to pursue advanced training of 7 years in scriptures and rituals, or join the 13-year Acharya (Masters) program in higher Buddhist philosophy. Thereafter, they may enter the traditional 3-year retreat according to the Mahamudra or Shangpa Kagyu tradition and qualify as Lamas. 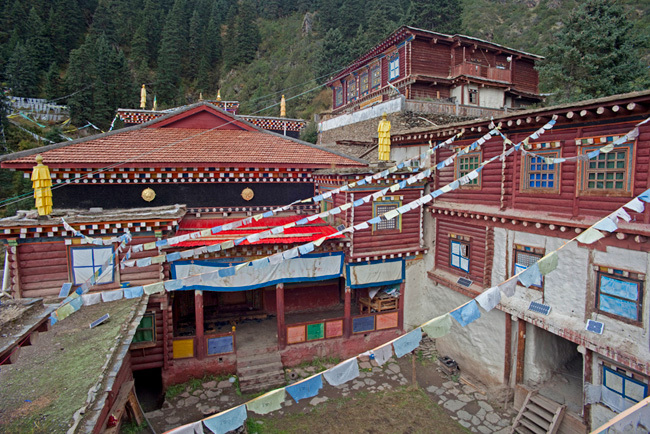 The first two monastic centres are Shangpa Kagyu retreat places in Eastern Tibet. They were established by the First Jamgon Kongtrul Rinpoche, Lodro Thaye: Tsandra Rinchen Drak in Dege founded in 1859, and Dzongsho Deshek Dhupe Phodrang in Peyul, in 1867. 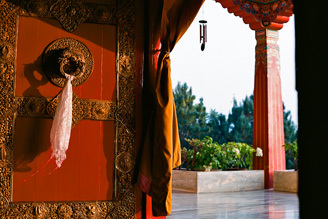 The monastic centres in India and Nepal were established by the Third Jamgon Kongtrul Rinpoche. 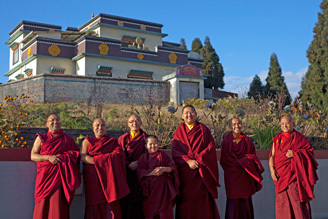 Kagyu Thekchen Ling Monastery in Lava, West Bengal, India, opened in June 1990. 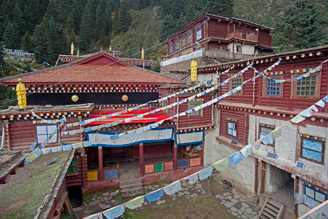 Its Shangpa Kagyu retreat centre, Ngedon Chagchen Ling, started in March 1991. 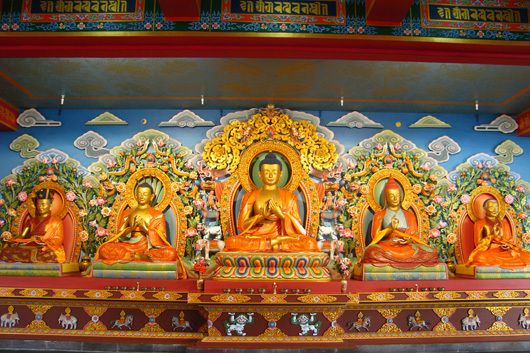 Pullahari Monastery in Kathmandu, Nepal, opened In March 1992. Its Mahamudra retreat centre, Kunzang Dechen Osel Ling, began in March 1994. The Third Jamgon Rinpoche also founded a community temple, Kinnaur Bodh Vihar in Sarahan, Himachal Pradesh, India, that completed in 2001. In 1982, during a visit to Rumtek Monastery, Sikkim, the Fourth Shelri Choktrul Rinpoche, a heart disciple of the Second Jamgon Kongtrul Rinpoche, offered Tsakhang Gompa, a seat of the Shelri Choktrul Rinpoches in Shey, Upper Dolpo, Nepal, to the Third Jamgon Kongtrul Rinpoche. Today, The Very Venerable Fifth Shelri Choktrul Rinpoche lives and studies with His Eminence the Fourth Jamgon Kongtrul Rinpoche. And abide for a very long time."